David J. Schwartz’s The Magic Of Thinking Big provides tips and methods which will help one with all aspects of their lives such as their jobs, their family, marriage, and social existence. The book states that one does not have to be a genius to become successful in life and that one only has to think big and follow accordingly. The Magic Of Thinking Big by David Schwartz deals simply with the power of thinking positively. 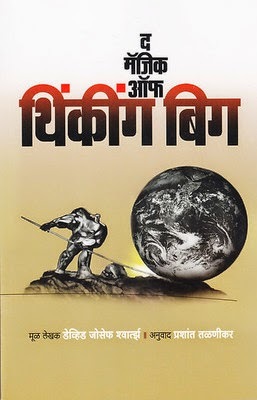 The book was first published in the year 1959. It narrates the story of a salesman who sold more products than all his other colleagues. The author points out that this was not because he was smarter or had more experience, but because he expected and knew he would sell more than the rest. This book also deals with seeing beyond appearances. Visualizing an object can be done by adding positive values to it. This requires rigorous mental training. The author also propounds on the power of good news and how it needs to be transmitted to those one is in conversation with. Providing good news also results in receiving it. The importance is given to one’s attitude and how one develops it. The Magic Of Thinking Big is a motivational self-help book which is aimed at doing away with negative habits such as procrastination, making excuses, and over-thinking things. Every chapter provides personal details about the author’s own life and the steps to be followed to overcome obstacles. The book specifies that making better decisions will lead to higher chances of success for an individual. The author also stresses on the importance of willpower, confidence, and motivation in every step of one’s life. 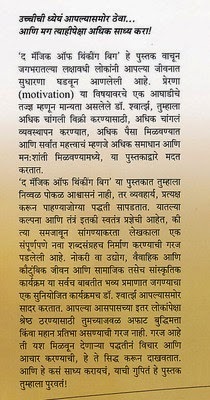 This edition is in Marathi. David Joseph Schwartz is a motivational coach and writer who is best known for his self-help book called The Magic o\Of Thinking Big (1959). Another book written by him is Maximize Your Mental Power. He was born in the United States on the 23rd of March, 1927. Schwartz was associated with Georgia State University but later became a self-help coach. He established a leadership consultancy firm called Creative Educational Services Inc.